No matter how old, we all love to feel a sense of achievement! At Swalings we celebrate success and progression with our unique Swalings swimming badge scheme. From a practical perspective, the badge scheme provides pupils with a structured, engaging and dynamic scale of development to recognise their growing ability in water skills and swimming distance. Younger children begin by learning the swimming skills basics as ‘Tiddlers’ and can work their way up to become confident, skilled swimmers as fully-fledged ‘Otters’. There are 5 badges to be achieved in each of our 8 fun animal categories: Tiddlers, Tadpoles, Terrapins, Turtles, Salmon, Dolphins, Beavers and finally Otters. We also acknowledge a pupils ability to swim short and long distances through the distance awards scheme to ensure they have the stamina and agility to apply their skills. The skills learnt throughout the swimming badge scheme incorporate water safety, lifesaving skills as well as swimming technique. We are keen to make sure that ever pupil progresses with confidence to ensure that they gain the knowledge and technical understanding in practise. For those pupils that join us as more confident swimmers, once we have gauged their level of competence, albeit we do not advocate holding anyone back, we would still encourage them to take part in achieving the appropriate badge for their ability to ensure they have learnt the additional skills mentioned previously. Badges are taken on week 8 (Skills) and week 9 (Distance) of the 10 week course. Each badge has several milestones which the pupil needs to fulfil to show competence and good technique before being awarded the badge. We feel that it is essential that each pupil learns these critical skills to ensure they can go on to enjoy safe, exciting and fulfilling experiences with water in their future years. 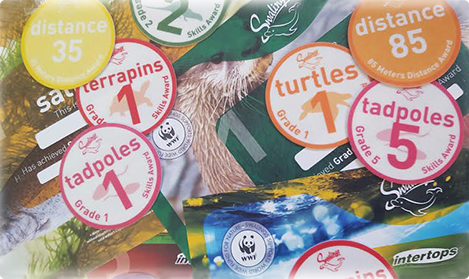 We are especially proud that our badge scheme is endorsed by the WWF. A class for young children age 2 months + and their parents to become familiar with the water environment and introduce them to swimming whilst having fun. A class for swimming beginners. We focus of developing children’s confidence in the water and dispelling any fear. Swimming strokes are introduced as well as increasing awareness of their buoyancy and floating positions. A class for children who have just started to swim. Water confidence, swimming strokes and breathing technique will be strengthened. We continue to develop your child’s swimming stroke technique and incorporate lifesaving skills such as treading water and improving their stamina. Swimming underwater, tumble turns and survival swimming will be introduced and we continue to improve swimming strokes. At this point your child will be a competent swimmer and have good understanding of water safety. However, we go on to teach the ‘extra mile’ so your child maintains and continues to improve these skills through distance swimming and personal survival. Advanced water skills, personal survival, lifesaving and distance swimming will be improved. Role plays and scenario setting will be used to apply their skills and knowledge. This class focusses on improving the technique of all four swimming strokes as well as diving, distance stamina and lifesaving. For young people with excellent swimming ability who would like to take their swimming to the top STA awards such as Bronze, Silver, Gold, Honours and Complete Swimmer Award. Our train to compete programme is designed to teach the fundamentals of competitive swimming from racing dive starts to tumble-turns.